Our hotel is located after Denny's on the right. We are located on the right, just past Denny's. 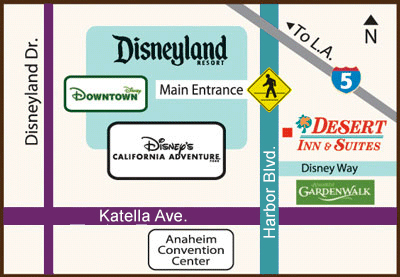 OK travelers, this hotel will fulfill your reason for staying there: proximity to Disneyland!!! Right across the street and reasonably priced! Conveniently, the hotel is sandwiched between Denny's and IHOP. So, if you don't like the free continental breakfast they offer, there are a plethora of options within a 1-3 min walk. Your room key even has a BOGO offer for a breakfast sandwich at McDonalds down the street! The free breakfast is OK. Nothing special, but if you want something quick, get there when they open, eat and run. If you're expecting a breakfast buffet with all the fixins, then don't choose this hotel - or go next-door. They serve apples and bananas, protein - boiled eggs and cream cheese for your bagel (or toast), a variety of breakfast cereals, coffee and danish. Our hotel rate was super reasonable and frankly, the breakfast was adequate for grab 'n go and it was FREE!!! After shelling out so much cash at the parks, it was a welcomed perk for at least one meal!!!!. Again, our main reason for staying there was to have a clean, convenient place to stay so we could theme park our brains out. They even have an observation deck for fireworks viewing if you want to catch them if you're not in the parks. The room was clean, and bedding was crisp - nicely made beds with attractive decor. We had a little room in front which was an added bonus! Had a fridge, microwave and a TV. Nice when you need some space from the sleeping kiddos. Self-parking was full when we arrived, but don't fret, valet parking is at your service. We didn't need our car for the 3 days, so no problem. And just so you know, you can't beat their parking fee!! $13 + tax ($15 total). That's $10 cheaper than parking at Disney!!! We were not looking for the Ritz, so I'm not going to complain about the furniture or other amenities they didn't offer that are offered at higher price hotels. That's not what this is. The ONLY negative thing I can comment on is that one of the two elevators doesn't go to the 4th floor. For luggage, just use the one that goes to the top. The front elevator stops at 3 and you have to walk up one flight. Probably has been that way since the early days of Disneyland. All in all, I give this hotel two thumbs up!!! Oh, and they even have an indoor pool. We didn't use it, so can't comment on it. Just didn't have the time to enjoy. I would definitely stay here again and recommend it to friends. Do it!!! Push the button!!! This is our fourth stay. We love how close it is to the entrance of the park. We like the free breakfast. Breakfast is a danish, muffin or toast, eggs oatmeal or cold cereal and fruit. Basic but does the job and something for everyone. Our rooms have always been clean and have just what you need if you are spending most of the day in the parks. The pool and hot tub are also nice. We will keep coming back! We had the best time!!! Shared a suite with friends...and walked to Disney each day...it was directly across the street! The kids loved the pool and we liked the breakfast selections each day. It was perfect for our budget and family.